Crisafulli's hydraulically powered propulsion and steering system for the Rotomites is unique in the dredge world. Providing both thrust and steering, the System provides adequate force to enable the horizontal auger on the cutterhead to engage, cut, and dislodge compacted solids. Unlike propulsion systems on many competitors' dredges, that either crawl along the lagoon bottom thereby generating substantial turbidity, or drive one or more "spuds" (or spikes) into the lagoon bottom that must be removed and the dredge relocated repeatedly by a support vessel during the dredging process, the Crisafulli propulsion system generates little or no turbidity and enables the Rotomite to be self-sufficient and move easily around the lagoon, canal, or river without external support. The System provides both forward and reverse thrust. Rotomite propulsion systems are more flexible and versitile enabling Rotomites to be more productive and less costly to operate. The dredge operators on Rotomites control the propulsion and steering system from the comfort of the Rotomite's air conditioned/heated Cab. The Rotomite’s Propulsion System is easier, safer, and less costly to use, is more self-sufficient, more reliable, and more versatile than competitors’ propulsion systems, and contributes to SRS Crisafull’s claim that Rotomites offer customers the fastest Return on Investment (ROI) and BEST VALUE. Crisafulli’s Rotomite dredges use a hydraulically powered marine propeller on the dredge’s stern to push forward (and pull in reverse) and steer the dredge. 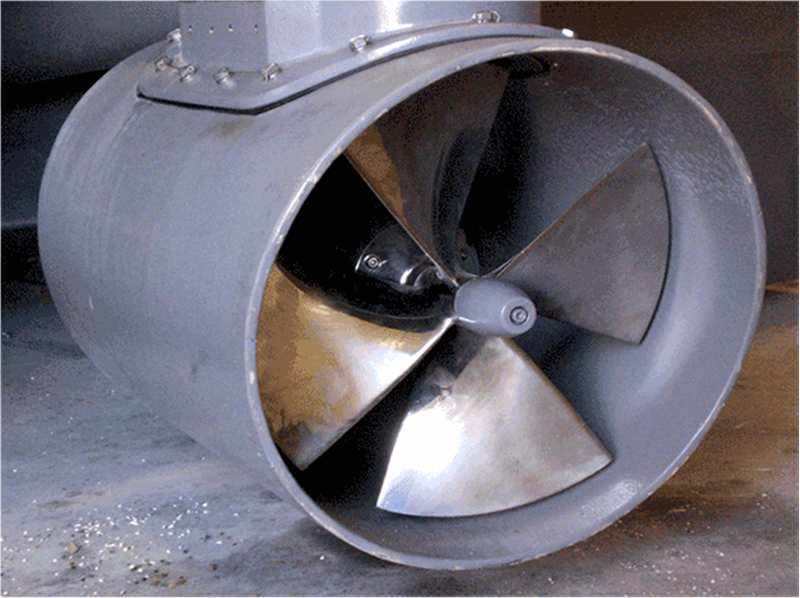 The Rotomite operator can turn the propeller close to 90 degrees, left and right, a total arc of almost 180 degrees, just as on a popular outboard marine engine used by many motorboats, that enables the dredge to turn in a very small radius. Propulsion System controls are integrated with other dredge control functions – i.e., to raise and lower the cutterhead, turn the cutterhead and pump on and off, and control the rotational speeds of the cutterhead and pump. The Crisafulli Propulsion System does not make contact with the pond, river, or channel bottom, and creates little or no turbulence. Generation of turbulence from disturbance of a river, pond, or channel bottom is generally considered undesirable. Because the Crisafulli Propulsion System does not require contact with the river, pond, or channel bottom, the self-sufficient Rotomites can be moved easily to multiple dredging sites while in the water and without assistance from a support vessel. Crisafulli’s system cannot strike docks, boats, etc. and is safer than open and unprotected designs that may strike and damage such objects. Crisafulli’s propulsion system (propeller) is enclosed and behind the dredge. Depending on the location of the customer’s dredging sites, the Rotomite's propulsion and steering system may eliminate or reduce the the number of times it is necessity to remove the dredge from the water, load it on a truck using an expensive crane, move it by road, and refloat it, again using a crane. Unexpected contact with obstructions on the bottoms of rivers, ponds and channels cannot damage the Rotomite's Propulsion System. The Rotomite's Propulsion and Steering System is simpler, has fewer moving parts, is easier and less costly to maintain, and is more reliable. Expensive downtime that disrupts production and causes personnel to stand by or divert to other assignments is much less likely with the Rotomite.